Welcome to Stone with Bishopstone and Hartwell Parish Council. 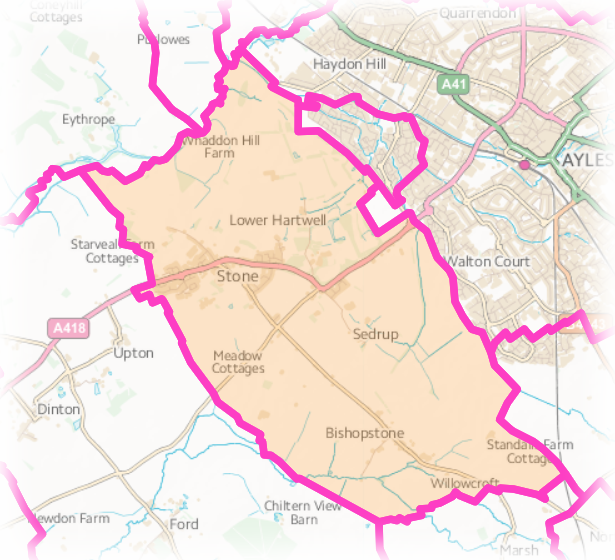 The Parish is situated just a few miles west of Aylesbury, in an attractive area of Buckinghamshire and in 2018 comprised around 1050 homes with a population of c.2300. The rural villages of Stone and Hartwell sit astride a sand and limestone ridge carrying the A418 towards Oxford and overlook the Thame Valley to the north and the Chiltern Hills to the south; Bishopstone lies a short distance to the south-east. In our website we outline the role and services provided by the Parish Council along with details of our councillors and their individual responsibilities. We provide you with the dates of our formal meetings (together with copies of the agendas and minutes) which all residents are encouraged to attend. You can also read our policy documents and details of the various Committees supporting the Council’s work and there is a very useful list of local contact numbers and email addresses. This site enables you to find details of our vibrant community, its recreation grounds, children’s play areas, footpaths and meeting places as well as forthcoming events so that you can take advantage of our excellent social and sports facilities. There are also links to AVDC and BucksCC sites so that you can report local problems directly to those responsible for their resolution, and links to public transport sites too. We welcome comments or requests for further information which should be passed to the Clerk (Contact Details Here). Set in the picturesque War Memorial Recreation Ground, The Jubilee Pavilion provides a modern and safe environment for any kind of gathering – wedding and christening receptions, children’s parties, family celebrations. With space for up to 50 people, it offers excellent facilities including a well-equipped kitchen and ample parking. For availability and booking enquiries, contact the Clerk here.